(VEN) - Senior officials from the 21-nation Asia-Pacific Economic Cooperation (APEC) forum, meeting on June 19 in the northeastern province of Quang Ninh, adopted a joint declaration on boosting sustainable tourism. The declaration emphasizes the important role of tourism in stimulating economic growth, promoting economic integration and regional connectivity. It also highlights the importance of sustainable tourism as a driving force for inclusive, innovative and sustainable growth. The declaration notes that the Asia-Pacific region is undergoing a critical transition in the context of global changes, and especially the dramatic transformations wrought by the digital era and the Industrial Revolution 4.0. It underscores the need to promote public-private partnerships as a key measure for the development of sustainable tourism infrastructure and services; create a competitive environment, support all tourism-related businesses, especially super small, small and medium-sized enterprises; carry out further research to make APEC economies adapt to and take advantage of new, advanced technologies. According to the World Travel & Tourism Council (WTTC), tourism contributed US$1.3 trillion to APEC’s gross domestic product (GDP), provided 67 million direct jobs and contributed 6.1 percent to the region’s export value. Tourism development has significantly contributed to poverty reduction, inclusive growth, and increased incomes of local communities. Tourism is expected to become one of the fastest growing sectors in the region, and is becoming one of the pillars of the economy and contributing significantly to the economic development of APEC members. The Industrial Revolution 4.0 is forecast to make major changes to tourism. 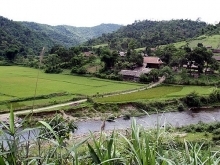 Minister of Culture, Sports and Tourism, Nguyen Ngoc Thien, said it is urgent to strengthen cooperation to ensure economic and social benefits, ensure all people have stable jobs and income earning opportunities, and contribute to poverty reduction. In enhancing tourism, countries must also preserve cultural values and promote exchanges, mutual understanding and protection and management of environmental resources and biological diversity. 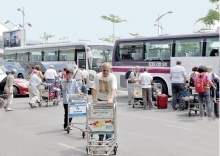 Thien added that the tourism industry in Vietnam is growing strongly, aiming to welcome 17-20 million foreign visitors and contribute more than 10 percent to the country’s GDP by 2020. 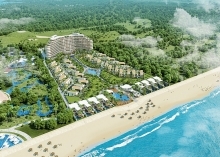 Vietnam is an attractive tourist destination in the world with its ancient, unique and rich cultures and history, picturesque natural landscapes, most beautiful beaches in the world, and a safe and friendly tourist environment, Thien said. “Nevertheless, we are faced with enormous challenges during this development to ensure economic, social and environmental sustainable development. More than ever, international cooperation to cope with common challenges is becoming a prerequisite to ensure sustainable and inclusive development for people and businesses,” he added. 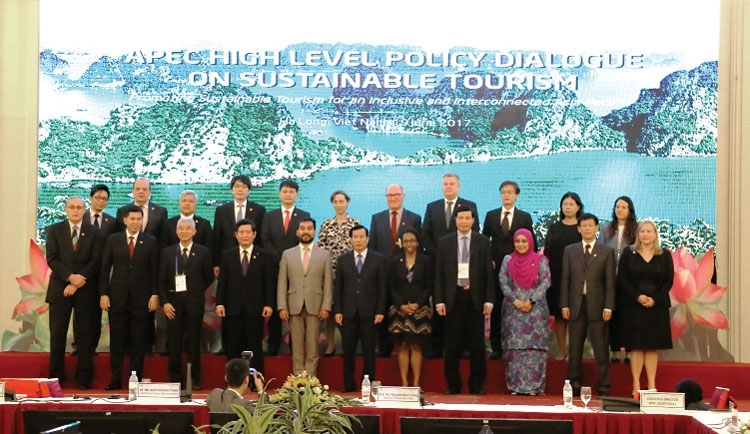 Tourism ministers and delegation leaders of APEC member economies agreed to report in November to the heads of the APEC member states on the importance of sustainable tourism promotion in the Asia-Pacific region.